I just got back from a trip to the Tetons. My brother Nick had asked me to take him up the highest peak in Teton National Park, the Grand Teton Peak at 13,770 feet. I have climbed this peak on two other occasions with my son Marty. Once when he was 10 years old and again when he was in high school. I met Nick at a motel in Jackson, Wyoming and the next morning we obtained our permit from the Jenny Lake ranger station. I had a permit waiting for me as I had contacted the chief ranger previously through my National Park connections as I continue to be the medical advisor for Zion National Park. It is a volunteer position but they do help me out with permits whenever I request. This year the snow pack was huge and hung around way into the last part of summer. I could see a lot more snow on the mountain peaks as I drove into the valley. The conditions seemed more like late June than late August. I did bring my ice axes in case we needed them, but the rangers told me that the route we had chosen was now free of any substantial snow or ice and I left them in the truck. We began hiking just before noon and 6 hours later arrived at the Lower Saddle to make our camp for the next two nights. We had very good weather and for the first time in many trips to the Tetons I did not get rained on. The second night on the mountain, however, we did experience very high winds and the tent was slightly damaged and we got little sleep. I also forgot to put my climbing shoes in my pack so we had to choose the easier Upper Exum Ridge climb as I had to lead climb in my approach shoes. Nevertheless, we had a great climb and enjoyed the summit for a full hour on August 22, 2011! I think Nick learned the meaning of "exposure" on the Exum Ridge at 13,000 feet. The day we hike down out of the mountains, Nick and I launched his drift boat on the Snake River. I rowed and paddled as he fished for the famous Snake River cutthroat trout. We spent about 4 hours on the river in fine weather with the Teton Range in the back drop. 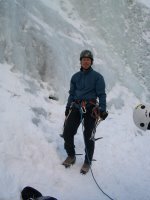 There are still many other peaks and rock climbs that I want to do in the Tetons so I expect that I will return there for many years to come. Becca has begun her second year of college at Iowa Western Community College in Council Bluffs, Iowa. She is once again playing on the women's soccer team. They had a preseason road trip to Utah to play several other schools, including Dixie State College. Most of the games were held at the new Rio Tinto stadium in the Salt Lake valley. It was enjoyable to watch her games at that cool stadium. They didn't win any of the games, but were playing 4 year schools as opposed to their usual junior college competition. Becca plays defense and is a solid soccer player and has incredible ball control. Her Mom & Dad think she is the best defensive player on her team. We wish her luck as the season continues back in the midwest. 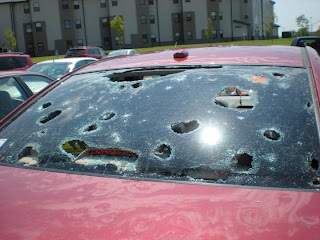 While she was with her team on the road trip to Utah a powerful thunderstorm swept through Council Bluffs. 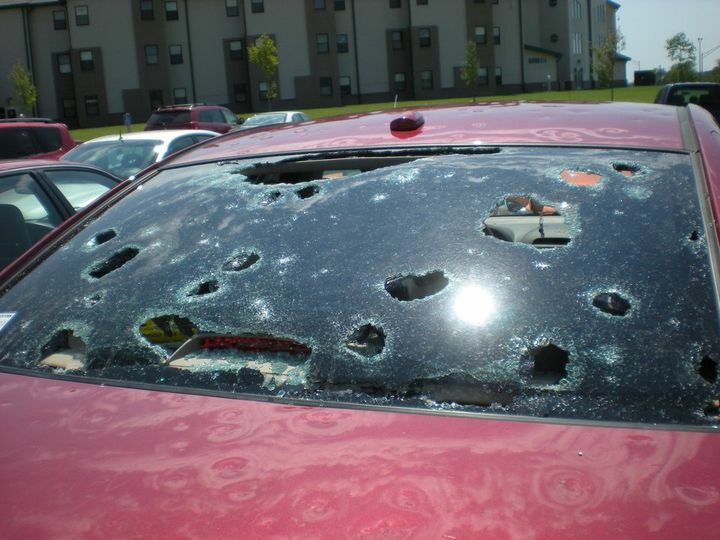 Baseball size hail struck the campus. Becca's car was severely damaged. She will need to have the car repaired.